Westphalia, MO (June 14, 2017) — TheraPlate, the Official Therapy Plate of US Equestrian, is proud to welcome professional trick riding team Trixie Chicks Trick Riders as the newest TheraPlate Brand Ambassadors. 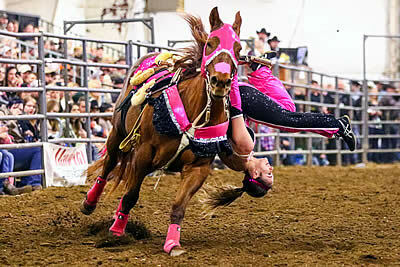 Based out of Westphalia, Missouri, these fearless women have made trick riding their full time careers, performing their daredevil acts and offering clinics and lessons across the continent. The horses that make these famous acts possible all benefit from the TheraPlate to stay in top condition for performance. Founded by trick rider Shelby Epperson, the Trixie Chicks Trick Riders is currently owned by Kelsey Temmen, who has a Master of Education in Equestrian Education at William Woods University and was the 2016 International Trick Riding Open Champion, Calgary Stampede Canadian Trick Riding Competition Open Champion, and North American Trick Riding Championships Open Women’s Champion. Epperson graduated with a Bachelor in Agriculture Business-Enterprise Management with an emphasis in Animal Science. TheraPlate’s innovative therapy platforms offer a wealth of benefits for horses across the disciplines, helping them to stay sound and conditioned simply by standing on the platform. TheraPlate uses low-intensity, dynamic movement to stimulate muscle contraction and increase circulation. In the process, it reduces swelling, builds muscle mass, fosters healing, and helps to prevent injury. The Trixie Chicks will be traveling through more than 17 states and two countries this year. To find out where to catch one of their stunning performances or attend one of their clinics (and try out their TheraPlate platform in the process), check out their full schedule at www.trxchx.com. Based in Weatherford, Texas, TheraPlate Revolution offers therapy platforms for both horses and their human teammates. To learn more about how the innovative TheraPlate can improve horses’ health, or to arrange a no-obligation trial, visit www.theraplate.com or call toll-free (800) 922-3685 or direct (817) 629-5171.